By Dr. John Popp, PhD. As I was researching the topic of liver function in healthy dairy cattle, I realized that the great majority of information available dealt with the metabolic diseases of the liver. It was almost impossible to find information that just discussed the function of the liver and how to keep it healthy. The intention of this article is to focus on what makes a liver healthy, not on the doom and gloom of hepatic lipadosis, fatty liver or ketosis, which is what we hear about the most. 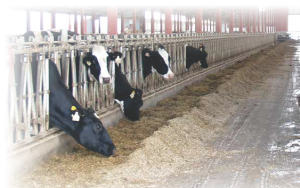 A healthy liver in a dairy cow serves many important functions: Glucose production/synthesis, detoxification of ammonia and production of antibodies. 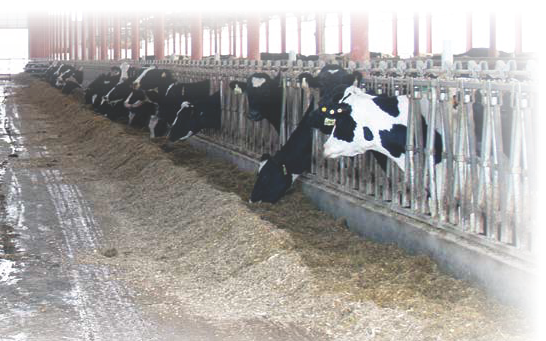 Rumen microbes metabolize starches supplied by the feed ration into the volatile fatty acids, lactate and proprionate, which are converted into glucose (fuel to run the body) via the liver. With onset of lactation, a cow’s energy requirement is tripled. High demands for glucose are for both milk synthesis and also reproductive performance. A cow in early lactation producing 80 pounds of milk needs a supply of 6 lbs of glucose per day just for milk production. As you can imagine, this is a huge job for the liver… so it has to be healthy. To complicate the situation, dry matter intake of the cow is usually insufficient at this time as well. When a cow is off feed (negative energy balance) and is not getting an ample supply of glucose from the ration, the cow’s body will start utilizing fat as the next available energy source. It is the liver that converts this fat into a useable energy source for the cow. If the liver is compromised or overwhelmed and cannot “clear” or metabolize fat coming in, it will become infiltrated with fat. This fatty liver condition can potentially turn into subclinical or clinical ketosis. When the liver reaches this state, it cannot do the job it is assigned to do; one defense mechanism is a reduction in milk production in an attempt to reduce the metabolic energy demand. 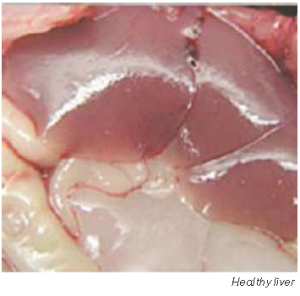 The picture above shows a healthy liver with a deep, purple color vs. a fatty liver with a pale, yellow color as a result of fat infiltration. Properly balance the dry cow and early lactation rations. This is the most important step in keeping the liver healthy and preventing ketosis or fatty liver. 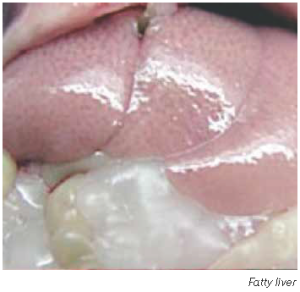 Fatty infiltration of the liver can occur as early as two weeks before calving. 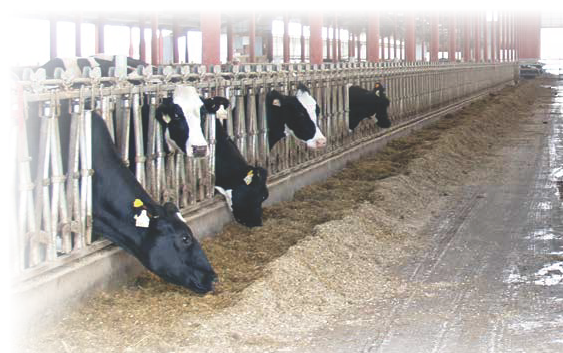 Maintain body condition of dry cows during the dry period – cows should not be gaining or losing weight. Monitor feed refusals and check for moldy feeds closely. Manage the bunk to prevent overcrowding. This will ensure access to good quality feed at all times. Minimize social group disruptions during transition. Limit pen moves to 3 or less during the transition period. Maintaining good liver health in fresh/early lactation animals is the key to a smooth, trouble free transition. It is important to monitor cows for proper liver function post partum and with the onset of lactation. A well-recognized and practical indicator of liver health is the measurement of beta-hydroxy-butyric acid (BHBA). Levels of BHBA are elevated when liver fat oxidation is incomplete due to fat infiltration of liver tissue. Cows with BHBA levels greater than or equal to 1.1 mmol/l are indicative of a herd’s prevalence for subclinical ketosis. 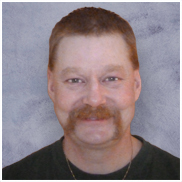 If you find yourself faced with clinical or subclinical ketosis in your herd, several very informative articles by Dr. Leiterman and Teresa Marker, Livestock Nutritionist, can be accessed via the Crystal Creek® website at www.crystalcreeknatural.com under the “Article” tab in the Dairy section. You may also reference Teresa Marker’s article on page 3 in this newsletter: “Turning Hidden Challenges into Opportunity on a Dairy Farm” that discusses subclinical ketosis in fresh cows and heifers. The liver has a huge role to play in the health of your transition cows. If you implement the above steps, you should find a reduction in liver related disorders in your herd. With liver disorders at a minimum, you will find the transition of your cows in the dry cow and early lactation cow period much less stressful for you and your cows.